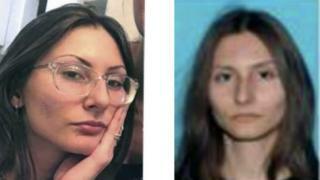 Schools throughout the city of Denver, Colorado, have closed for the day as authorities search for an "extremely dangerous" woman. "All facilities and programmes are closed for the day - no employees are to report," Jefferson County Public Schools posted on Twitter, saying they had made the decision "in collaboration with other Denver-metro area school districts". Jefferson County sheriff's office earlier posted photos of the woman on Twitter. She is described as an 18-year-old white female from Florida last seen wearing camouflage trousers, a black T-shirt and black boots. "She is armed and considered to be extremely dangerous," the sheriff's office post reads. Columbine isn't even among the ten deadliest mass shootings in this country any more. Yet, it is still a tragedy that cuts deep and becomes more painful with each reminder that nothing has changed. The suspect's family has urged her to turn herself in. "It's like a bad dream. We don't know. We don't have any ideas," her father told CBS Miami.